Welcome to the first day of our 12 Days of Christmas Sale. 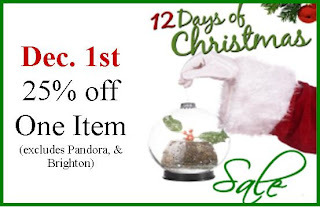 We will be emailing a different sale area or item on the day before from now through Dec 14th. Please note that each sale item/area is valid only on that particular day. 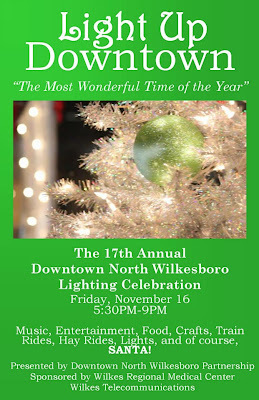 Please mark your calendar with your days of interest. 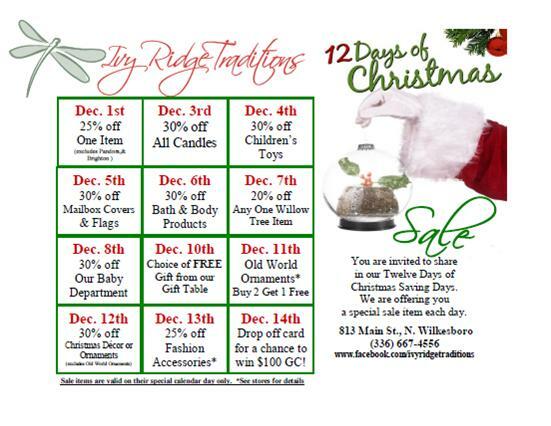 Welcome to our 12 Days of Christmas Sale. We will be emailing a reminder each day of the next day's sale item/area to our blog subscribers as well as the shop email list. Please email us at angela@ivyridge.com if you would like to be added to the shop email list. As Vera Bradley commemorates the company's 30th anniversary, Liz, Vera Bradley's Trend Reporter, sat down with Executive Vice President of Design Kim Colby, Vice President of Design and Product Development Veronique Poudrier and Merchandising and Assortment Manager Emily McCabe for the details on Leather Trim. 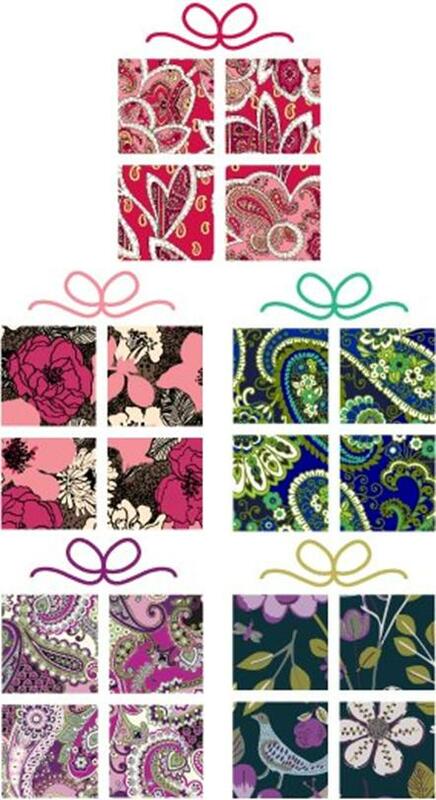 Liz: What made you choose this combination of material to celebrate Vera Bradley’s 30th anniversary? VP: We love the idea of dressing up our patterns for a special occasion. We were inspired by the fashion trend of mixing print with texture and colors. For our 30th anniversary we wanted to create a few special styles that give the identifiable Vera Bradley print an unexpected and polished element. As this trend continues, we look forward to giving you more colorful options to mix and match with your favorite Vera Bradley prints. EM: Adding leather trim is an easy way for our consumer to express herself. We decided to release it over the holiday season because it is the perfect time for her to dress up her look. Liz: How did we select the colors for Leather Trim? VP: Editing down to a few colors is always difficult! 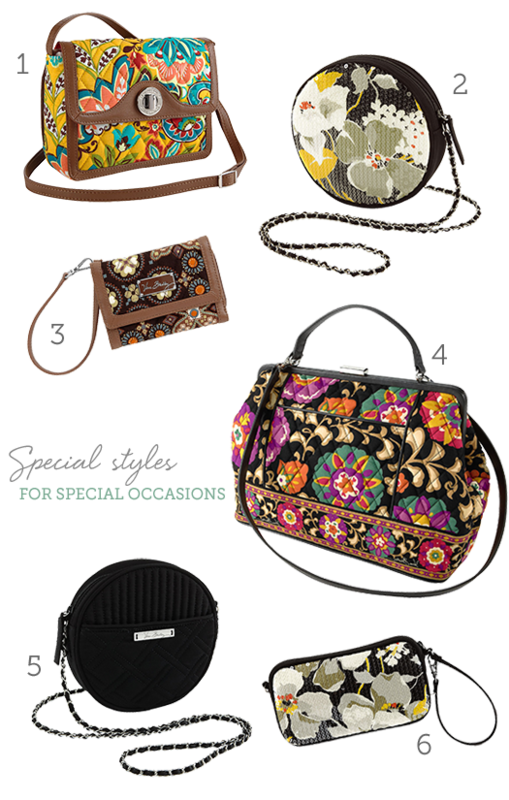 We wanted this collection to be exclusive, so we limited it to four colors, which were selected to represent a range of Vera Bradley print styles. EM: Each color offers a different look and feel, and ties back to the rich black or brown leather trim the design team selected. KC: Choosing neutral-colored leather let the hues of each pattern shine. We selected some of the newest colors as well as Suzani (from Winter 2011). We just couldn’t resist Suzani’s trendy jewel-tone palette combined with rich black trim. Liz: What is the story behind the names of each style? VP: The Barbara, a frame bag named after our Co-founder, is Barb’s favorite. The Patricia is a crossbody, one of our most popular styles, and is stylish and practical. And, the Anniversary Wristlet, in its minimalist way, allows functionality to still be chic and timeless for girls of all ages. It’s a piece you can carry with you as an accessory or on its own. 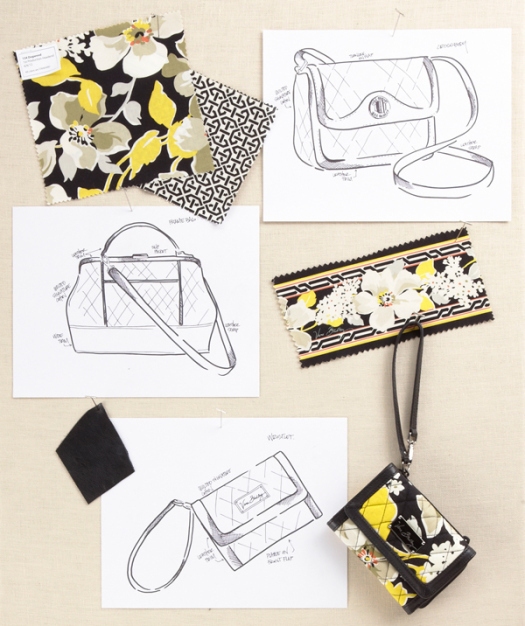 KC: Thinking about 30 years of Vera Bradley we immediately thought of our Co-founders Barbara and Patricia, and how perfect it would be to celebrate this milestone by naming a style after each of them. Liz: Which is your favorite piece from the collection? VP: The Patricia Crossbody! I love its double personality. On the front, the leather trimmed flap and logo turnlock give it a great classic look. The interior is just roomy enough for all your basics, but then you unzip the back panel and find a complete wallet function. Chic and practical; it’s the best of both worlds. KC: I love the Barbara Frame Bag! It’s the perfect mix of color, style, sophistication and fun. The size and silhouette are so good looking. It’s a great new classic. EM: The Barbara Fame Bag is my favorite, too. I love the frame detail and the fact that it functions as a handheld style or a shoulder bag with the detachable strap. I carry a lot of things, so I love that it’s spacious enough to carry my essentials, yet stylish enough for a night out. When I carry this bag it feels like a part of my outfit and makes me feel special! Liz: Did you have someone or something specific in mind (a certain customer, a certain trend) when designing these styles? VP: We were really striving to cover all the features our customers love: function, great style and practicality. Plus, we wanted to give them a little extra dimension with the leather trim; that unexpected delight we love to offer. We all know that it is very difficult to turn pork sausage into health food. You basically have to use another form of protein and favor it up. 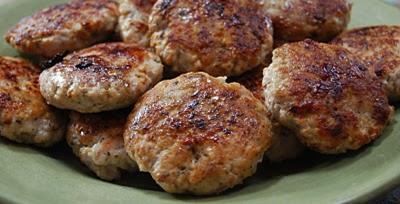 I have tried several turkey sausage recipes with no amazing favor until the recipe below. The key ingredients for a flavor different from others are the apple and onion which add moisture as well. I often eat two turkey patties (52 calories each) with two frozen "thin" biscuits (112 calories each) for a filling low-calorie breakfast. Heat olive oil in a nonstick skillet over medium-high heat. Shred onion and apple in the food processor. Add onion and apple; sauté 3 minutes. Add garlic; sauté 30 seconds. Remove onion mixture from pan; cool completely. Combine onion mixture, thyme, sage, salt, pepper, and turkey, stirring well to combine. Divide mixture into 24 equal portions, shaping each into a 1/2-inch-thick patty. Heat a large nonstick skillet coated with cooking spray over medium heat. 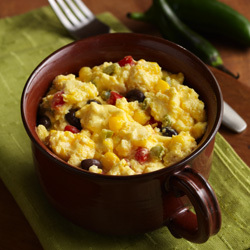 Cook in 2 or 3 batches depending on how large your skillet is but don’t over crowd the skillet. I did 3 batches of 8, cook 3 minutes on each side or until done. Keep warm. Repeat procedure with remaining patties. Your PANDORA jewellery must be carefully handled and cleaned regularly to maintain its beautiful appearance and ensure its longevity. 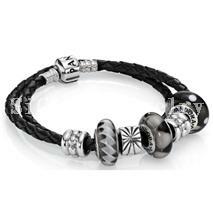 Especially all sterling silver will tarnish over time. But it will happen much faster when it comes into contact with agents such as perfume, salty air, sulphur, skin creams, hairspray, chlorine and acidic skin ph. The amount of tarnishing (oxidization) that occurs is dependent on the skin and care habits of the wearer. Tarnishing is therefore not a manufacturing fault. A jewellery polishing cloth may be useful, when you need to freshen up your PANDORA jewellery, as it can sparkle up a dull surface. But be extra gentle when polishing pieces with organic materials like wood, pearls and leather. Only polish the metal part with the cloth. If you wish to clean your PANDORA jewellery more thoroughly at home, add a drop of mild soap to lukewarm water and clean the jewellery with a soft toothbrush. The toothbrush is an excellent tool for jewellery with patterns, which may otherwise be difficult to clean. If a piece of jewellery is very dirty, leave it in lukewarm water with a drop of dishwasher detergent and let it soak for a few minutes. Please observe that jewellery with leather, wood or pearls should not be cleaned using this method. These materials may never be soaked or rubbed. You should never expose PANDORA jewellery to liquid silver cleaner or other harsh chemicals, not even chemicals meant for cleaning jewelry. Jewellery cleaning agents may alter the colour of the jewellery and damage the organic parts such as leather, wood or pearls. Use a very soft and dry cloth for cleaning your leather jewellery. Leather conditioner can be applied and will serve to protect the leather from spills or stains, and helps keep it soft and supple by restoring essential oils. Using professional leather conditioners is a great way to improve the overall lifespan of the leather, making it resistant to water and humidity. Stains can be removed from the leather. They should be removed immediately before a substance has a chance to soak in or dry onto the material. The cleaning of leather should be done gently, by hand. It is recommended that you use a mild professional cleaner (without chemicals). You can also clean leather with a mild soap such as soap flakes or a saddle soap. Create suds in a bowl and apply the suds to the leather surface with a soft lint-free cloth. Do not use the soapy water. The suds are safer to use as they reduce the risk of bleach type marks and streaks. Be careful to keep the cloth barely damp - not wet. Use a dry soft cloth to wipe up any remaining moisture and let it dry completely. Use the damp cloth on the entire piece to avoid areas, which will seem lighter after cleaning. Do not try to dry the leather item near heat, as this will cause the leather to become brittle and possibly shrink. After the cleaning of the item is complete, rub a leather conditioner into the material. Great Outside Christmas Decorating Idea! This idea is so simple and easy, it needs no explanation. For many, Black Friday is about the tradition of shopping with friends and family. For others, it's the thrill of pursuing the prettiest price. Whatever your plans, we hope the lines move swiftly, the crowd is kind and the deals are delightful. And don't forget, to stop stop by to see us, because we want to see you in action! As always please don't hestiate to call us with any questions you may have about our specials at 336-667-4556. You will be pleased with our surprise gift pick this year. This is while supplies last. 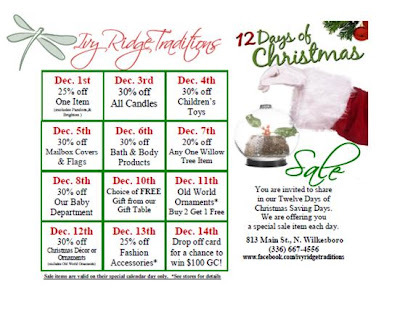 Simply print out the above coupon or mention "Blog Post Surprise Gift". $100 or more Vera Bradley purchase! On Friday, November 23 only, shoppers can score a free Vera Bradley limited-edition Holiday tote with any Vera Bradley purchase of $100 or more! 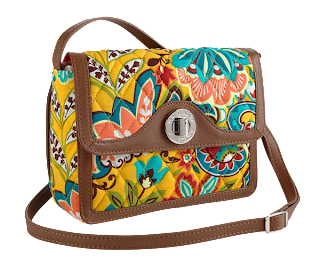 The Vera Bradley freebie will be available in the Dogwood print as pictured below, and is valued at $42. What a great reward to yourself for knocking out your holiday shopping! 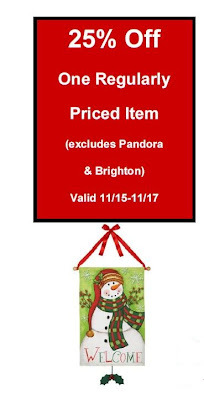 The charm is a silver present with red enamel ribbon and a Pandora"O" tag from the top. 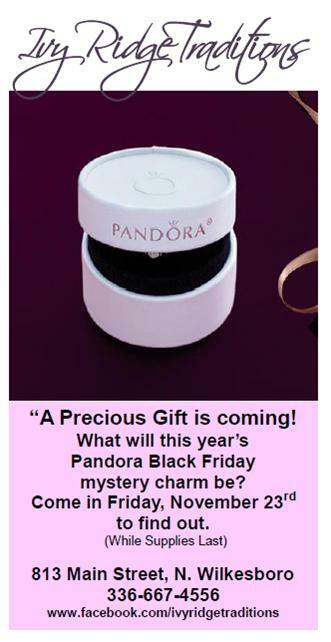 The price is $55 and the charm comes in this cute little box shown above. 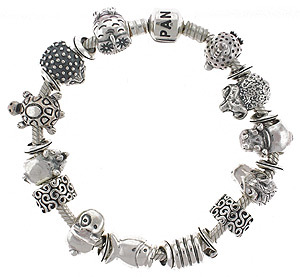 This charm is adorable! We will be emailing a photo of the charm itself on Thursday, November 22nd to our customer email list (the date Pandora allows us to reveal a photograph of the charm). Again this is while supplies last. 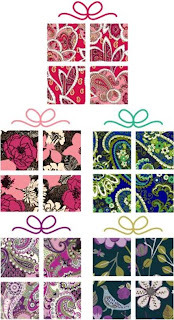 Retiring colors: Rosy Posies, Mocha Rouge, Rhythm & Blues, Very Berry Paisley and Floral Nightingale. The retiring styles are 30% off also (which includes bags in current colors) are: Backpack, Hatbox Cosmetic, Lunch Date, Gallery Wallet, and Chain Lanyard. Inspired by a Perfect Man ~ Snowman That Is! Two more unique snowman tree toppers in to color-combinations. My Healthy Breakfast Mug! A Great Way to Start the Day! Make an Old Wreath New Again! We have handmade bows for wreaths, lamp posts or your Christmas tree, only $6.99 each. These are hand-tyed by our own Steffi! I have added photos below of all our bow colors that we currently have in stock. Join us for Light Up Downtown North Wilkesboro, Friday, November 16th! Don't forget to vote for our Christmas window for the People's Choice Winner! Mark your calendars for our Ivy Ridge Christmas Open House, Thursday, Friday & Saturday, November 15, 16 & 17. 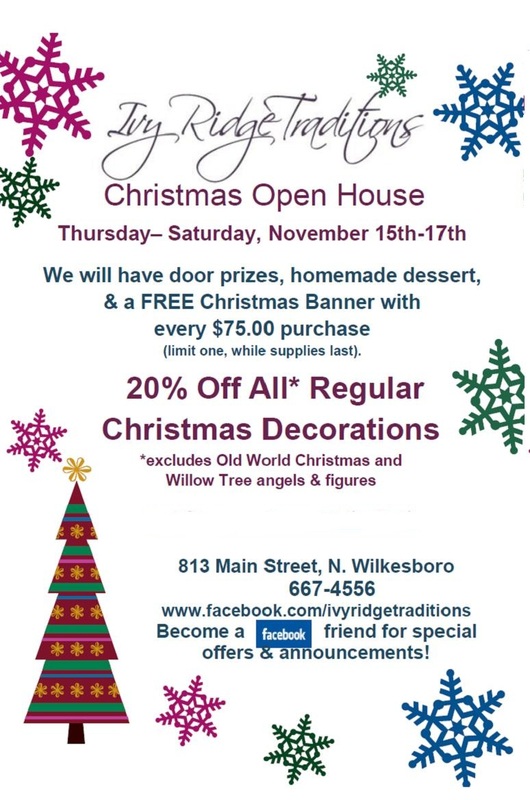 Door prizes, special discount coupon and Christmas decor discount just for you, refreshments and a FREE surprise gift with every $75.00 purchase. 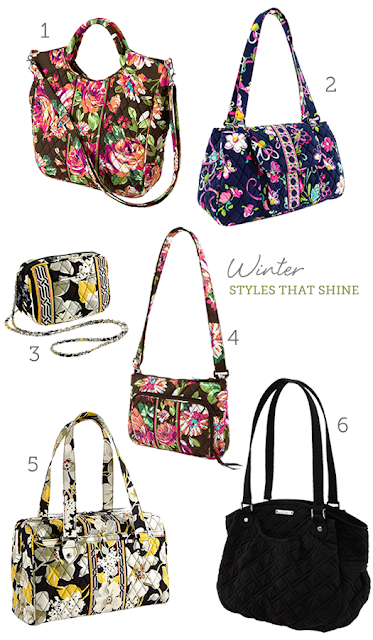 Vera Bradley Winter Premiere is TODAY! Two new great colors, Dogwood and English Rose, plus over twelve new purse styles! There is something for everyone! 1. Two Way Tote: Multi-functional with a top handle and a long shoulder strap for shoulder, crossbody or handheld carrying. 2. Edie Satchel: Features a magnetic flap closure with a slip pocket underneath, and a spacious interior with three compartments. 4. Little Hipster: A rectangular crossbody with an adjustable strap and a front zip-around compartment with components of a wallet. 5. Caroline: A zippered top opens to reveal a roomy interior with one zippered pocket and three slip pockets. 6. Glenna: A luxuriously large interior includes one zip pocket and three slip pockets, and closes with a recessed zipper. 1. Patricia Crossbody: This new crossbody, featuring our Signature colors and luxurious leather trim, has a classic style that will turn heads now and for seasons to come! 2. Shimmer Evening Bag: With a unique canteen shape and an overlay of clear sequins, this makes the perfect festive evening bag. 3. Anniversary Wristlet: Our Signature colors pair perfectly with rich leather trim to make this style oh-so-very special. 4. Barbara Frame Bag: Featuring our Signature colors and rich, supple leather, this brand-new style is just what the doctor ordered! 5. Little Black Bag: Its unique canteen shape is perfect for cocktails or a casual evening out with the girls. 6. 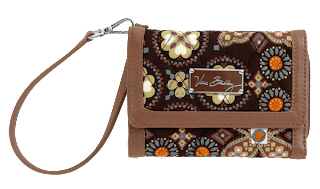 Shimmer Wristlet: All dressed up and everywhere to go, this dazzling wristlet looks great day or night.